RCM超人银币的空红蓝色怪兽盒 These boxes originally held the 1 oz 2016 Superman coins, but are suitable for holding up to 20 tubes of any RCM silver coins between 3/4 oz to 1.5 oz. 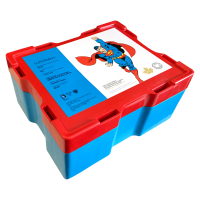 These official boxes are direct from the mint and come complete with lids and Superman label. Organize your stack and make it easy to store.